The Penitent - Lets you cast Penance on a friendly target. There is currently no PVE situation where this is a viable choice, you lose too much damage and by extension healing. Castigation - Gives Penance an extra tick, as Penance makes up a huge portion of Discipline’s output, buffing it by 33% with no downside is massively strong. This is the default pick for all content. Schism - Essentially only useful if you want to go full dps with very little focus on healing. The main limitation to Discipline’s output isn’t a lack of damage but having the mana to apply Atonement. Angelic Feather - Default talent for all content, on demand movement speed on any person in your group. Body and Soul - Good for solo content as it gives a higher average movement speed than Angelic Feather. Not recommended for any group content as you want to choose who to target Power Word: Shield on for the maximum healing, this gives a lot less control than feathers. Masochism - Mobility is very nearly always better than this, it is only really useful in threatening solo content that you can’t kite. The choice here is mostly irrelevant in raids. Shining Force - A targeted knock back that slows the enemies after. Great for dungeons if the tank is getting hit hard and needs to kite. Psychic Voice - Reduced fear CD. Useful in dungeons if you have Sephuz's Secret as it makes Psychic Scream line up perfectly with the cooldown. Dominant Mind - Useful for bolstering weeks, as mobs you Mind Control can't gain bolstering stacks while they're under your control. Power Word: Solace - Returns less mana than Shield Discipline, deals damage in a less useful way than Mindbender, there is no reason to pick this talent. Shield Discipline - Gives the highest mana return by a considerable margin, makes Power Word: Shield an even more efficient global. Pick for all content where mana is relevant. Mindbender - Significantly lower mana return than Shield Discipline, however it gives you a very strong 1 minute burst cooldown. Any fight where you’re given lots of external mana in the form of Innervates or a boss mechanic (Tichondrius) this is worth taking. Default for all dungeon content as you can drink between packs so mana isn't relevant. Contrition - Default pick for all raiding scenarios, provides more healing than the other two options. Power Infusion - Inferior version of Contrition, not worth taking on any raid fight. Best for going full dps and useful in dungeons. Twist of Fate - How good this talent is depends on the uptime you’re getting, for it to beat Contrition you need extremely high uptime (40%+). As Atonement doesn't make up as large a percentage of your healing in dungeons, contrition is lower value and Twist of Fate pulls ahead even at lower uptimes. Divine Star - The directional and range requirements as well as the relatively short CD cluttering an already busy rotation mean you never pick this in raids. It can be okay for dungeon trash dps as Halo’s large range makes it hard to use on some packs. Halo - Default for raids and dungeons. The range it does damage at is a little larger than the indicated circle so in dungeons be aware you can pull extra if you’re not careful. Both Halo and Divine Star transfer only the first damaging hit only to Atonement healing. Purge the Wicked - Makes Shadow Word: Pain cheaper, last longer and cleave to a nearby target when you cast Penance. Exceptionally strong on any fight where you’re able to make use of the cleave and still the best talent for raiding in general. Grace - Since in raids the majority of your healing will be Atonement and your non-Atonement based output (mostly Power Word: Shield) will be applied to people without Atonement, this talent is fairly low value. It’s a must pick for any challenging dungeon content though, as you’ll be making much heavier use of Shadowmend. Shadow Covenant - There is no PvE situation where this is the correct talent to take. 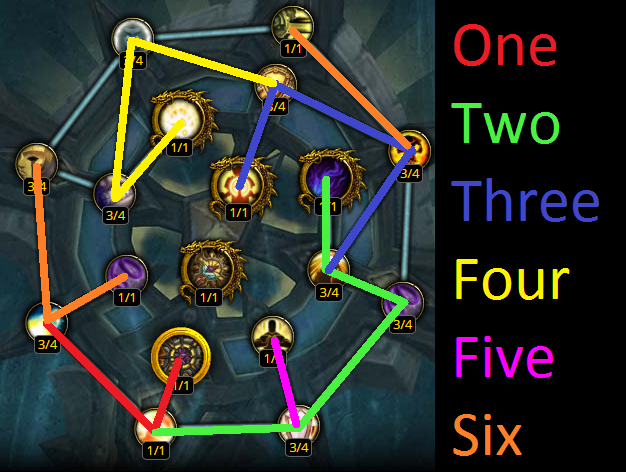 For the new traits in 7.2, go straight for the new golden Aegis of Wrath then fill up the rest of the artifact according to the following priority list.